It’s time to shift taxpayer funding away from Planned Parenthood to support local Federally Qualified Health Centers. 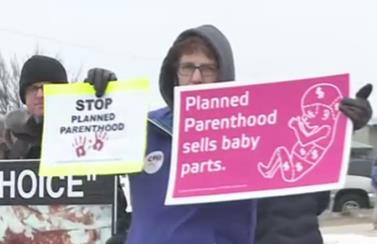 Planned Parenthood receives $528 million in taxpayer dollars from the federal government. Your taxpayer dollars are funding over 300,000 abortions per year through Planned Parenthood. In 100 years, Planned Parenthood has aborted over seven million babies! Ask Congress to redirect our taxpayer dollars to the Federally Qualified Health Centers that are more numerous and provide more comprehensive care for women and their unborn children. Sen. Heidi Heitkamp (D-North Dakota): call (202) 224-2043, email and/or write Sen. Heidi Heitkamp at SH-110 Hart Senate Office Building, Washington, D.C., 20510. Let the Senator know that you are associated with Concerned Women for America of North Dakota. Sen. John Hoeven (R-North Dakota): call (202) 224-2551, email and/or write Sen. John Hoeven at 338 Russell Senate Office Building, Washington, D.C., 20510. Let the Senator know that you are associated with Concerned Women for America of North Dakota. And, be sure to thank Sen. Hoeven for Cosponsoring S.241, a bill to prohibit Federal funding of Planned Parenthood Federation of America! Pray that our leaders will understand the atrocities of abortion and vote to defund Planned Parenthood.